UPDATE:I have learned that there are likely two different sets of Peace Now attackers. The suspect described below who confessed to price tag attacks is the one who phoned a bomb threat to the Peace Now office. 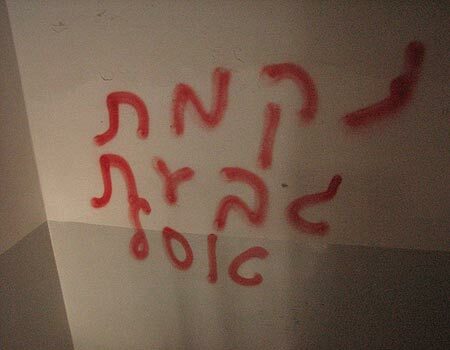 It is thought another perpetrator vandalized Hagit Ofran’s apartment building and her neighbor’s car. This individual has not yet been caught. Please keep this in mind as you read the account below written earlier. UPDATE I: I had thought that there was only a gag order against revealing the name of the suspect in this case. But after Rotter deleted my post with a link to this blog post, it appears there is a specific gag also revealing that the father is a senior Shin Bet officer. That’s the way the national security state operates in Israel, protecting its own. Israeli media are reporting (Hebrew) that the police have arrested a suspect in the Peace Now price tag attacks and death threats against Hagit Ofran. The suspect has confessed to his role in phoning bomb threats to the Peace Now office and vandalizing Ofran’s apartment building with graffiti wishing her dead. But the family has secured a gag preventing identification of the suspect. When he appeared in court, the father, according to Haaretz, threatened the reporters and photographers there with jail if they published anything. He then secured a gag from the court. Two separate Israeli sources have confirmed that the suspect’s mother is a police officer and one of these sources also confirms that the father is a senior Shin Bet officer. This explains why the father screamed in court at the journalists: “Do you who I am?” and warned them they’d end up in jail if they violated his son’s privacy. No one should be surprised that the son of a Shin Bet officer and policewoman should be a right-wing terrorist. After all, police officers were among the attackers at Anatot who mauled peace activists there. The police are also the guiding force behind the closure of All for Peace Israel. The force is riddled with right wing extremists like Meir Rotter, who publicly wrote that settler supporters should beat up activists at the Sheikh Jarrah protests. The Shin Bet is a bastion of right-wing extremism as well and never seems to be able to capture Jewish terrorists. Can you imagine if this suspect had been known to the Shin Bet as a potential terrorist? How would they deal with the child of a colleague as a criminal? Of course, they’d protect him. However, in this case, the attacks were so public and egregious that the police couldn’t simply make the case go away. Though they can make it go away once he goes to court, with a minimal charge and jail time (if any). If the parents worry that their child’s arrest and possible conviction for these acts will tarnish their reputation they needn’t fear. It appears that most officials in this far-right government or their offspring would love to do what this individual has. So birds of a feather not only flock together, they cheer each other on. The father and mother are more likely to receive promotions than be disciplined. In fact, I half expect dad to get a plum new assignment as chief of the Jewish terror section. I do not yet know the identity of the suspect. But any Israeli brave enough to offer the information will earn the undying gratitude of Israelis and those around the world who still believe in freedom, the rule of law and democracy in Israel and elsewhere. It’s not that I know anything, but I won’t be surprised if he is from the settlement Anatot. Police officers from there are known for their habbit to threaten to arrest citizens they argue with, even when they are off duty… One of them tried it on me. One of the graffitis from the crime scene read “Revenge of Giv’at Asaf”. This could mean that he is from that settlement, but not for sure. Could be. But he specifically referred to it because there was an evacuation of an illegal outpost there & price tag usually takes “revenge” for such specific acts. In that case it is strange that the police caught the vandal in the first place. Maybe they did not know who are hi parents. This is a new type of screwing up. Maybe this marks the end of the career of the policemen/women that caught him. well, you’re not commited to the gag order, just give us the name. I’m working on it. Don’t you think I’d report it if I had it? Meir Rotter is police, not Shin Bet. So unlikely it’s his son. The family and the criminal all reside in Jerusalem Mevaseret zion,the father is a low key ex police officer not Shabak. And they are seriously not pleased to say the least and very ashamed of their son Jewish terror acts. I have 2 completely independent sources who say he’s senior (though not most senior) Shabak & mother is police woman. I’d be willing to amend my report if you can provide any proof that what you say is correct.